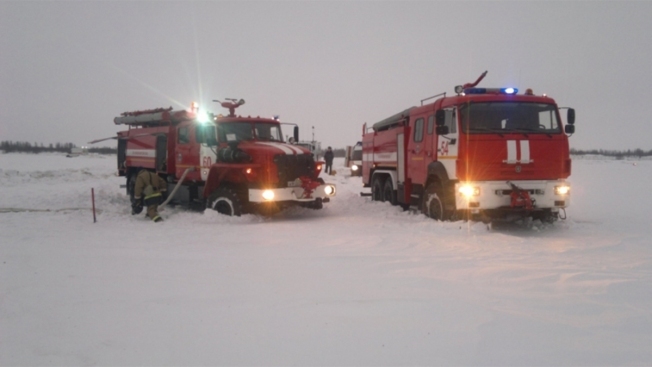 Russian emergency services search for victims and wreckage of the crashed An-148 twin-engine regional jet, which went down minutes after takeoff on Feb. 11, 218, in a snow field outside Moscow. Wading through knee-deep snow, hundreds of emergency workers searched a vast field near Moscow on Monday for remains of the 71 victims from the crash of a Russian airliner, and aviation experts began deciphering the jet's two flight recorders. President Vladimir Putin put off a planned trip to Sochi and stayed in Moscow to monitor the investigation. The Kremlin said U.S. President Donald Trump called Putin to express his condolences. Another Russian operator that uses the plane, Angara, based in Irkutsk in eastern Siberia, said it will keep flying them. The Defense Ministry and other government agencies that also use the aircraft haven't grounded them either.